The Lamb is now available for pre-order now in our mini mart. Initial LP pressings available exclusively through hardlyart.com come with clear vinyl with blue swirl. Lala Lala have announced August dates supporting WHY? and LVL UP. A current itinerary is below and more dates will be announced soon. Hardly Art is pleased to announce that Seattle riffers Versing have officially joined the roster. The four-piece has been turning heads in the city for the past two years with their taut and brainy take on Northwest rock, and today they’ve shared “Silver Dollar,” a digital single that constructs a narrative around the social injustice of so-called “affluenza.” Revolver premiered a music video for the track this morning, which you can watch via the links above. Versing will be on tour next month across the West Coast, see blow for a full list of upcoming dates. 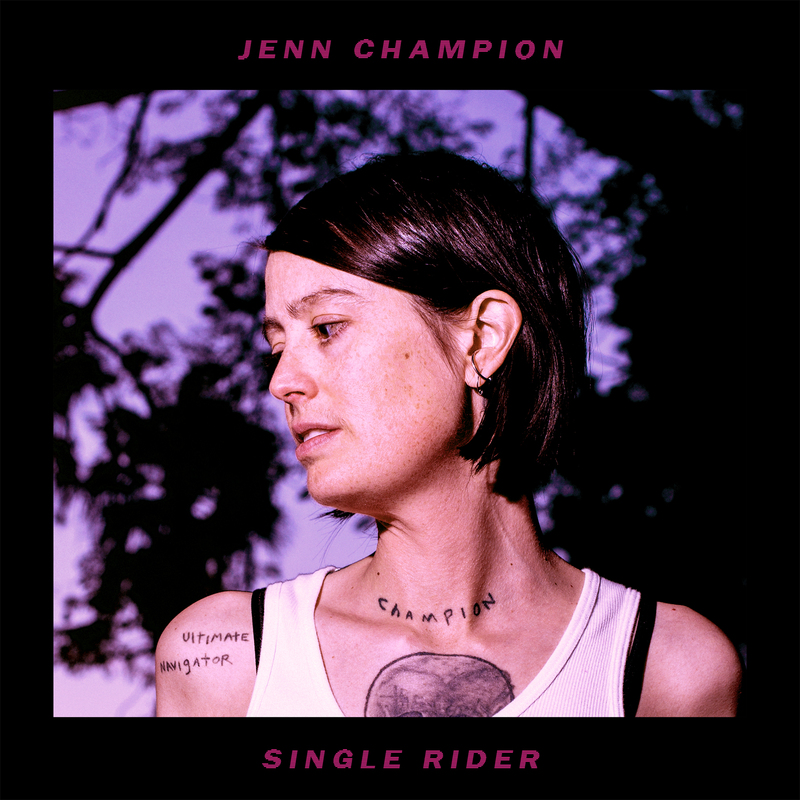 Jenn Champion’s alluring new album Single Rider is less than one month away from release, and today the LA-based songwriter has shared a colorful, rhapsodic music video for “Coming For You” by director Jen Harrington. Apply some glittery eyeshadow and watch it via the link above. “Coming For You” is also available for your listening pleasure everywhere music is streamed. Pre-orders for Single Rider are available now on all formats. After months of anticipation, La Luz’s lush, lysergic new album Floating Features is finally out today. Shot through with rays of smoggy LA sunshine, the record navigates disorienting dreamscapes throughout its 11 impeccable tracks–particularly “Mean Dream,” which has a new music video from director Ryan D. Browne that premiered this morning on Brooklyn Vegan. Bend your mind and watch it in full below. Tonight in San Francisco, La Luz play the first show of a massive 35-date North American tour. See below for a full list of dates! Tonight in Birmingham, Seattle band Dude York bring their lauded power-pop sound to Europe for the very first time. In honor of this transatlantic rock-and-roll goodwill mission, the band has shared an exceptionally rambunctious new single called ”Moon,” which features vocals from bassist Claire England and premiered earlier via Gold Flake Paint. Per the Dudes York, “Moon” is “a note to self that success doesn’t equal fulfillment and a reminder that nobody does it all by themselves.” Dude York support Nashville’s Bully on these dates, which you can peruse in full below. Stay tuned for more from this ever-restless trio. Jenn Champion’s 2016 No One EP and her recent synth-laden cover of Yes’ ’80s gem “Owner of a Lonely Heart” hinted at a new , neon-tinged direction in her sound. Now, Champion’s long-held fascination with chart-topping bangerz has borne “O.M.G. (I’m All Over It),” the most exuberant expression of her pop-leaning tendencies yet. The digital single is now streaming worldwide, and you can watch the official music video for the song below. Co-directed by Champion and Jimmy Bazan, the video features appearances by LA’s HyperBody and IAN SWEET, and lots and lots of leotards. The Moondoggies’ A Love Sleeps Deep Out Now! The Moondoggies have returned after a years-long hiatus with their most blistering release to date. The new full-length album, A Love Sleeps Deep, out today, is overflowing with pent-up energy and excursions into psychedelic expanses. Fans of the Americana five-piece can hear these new jams today when the band performs live at 12 PM on the airwaves of KEXP. Tonight in their beloved Seattle, the Moondoggies play a record release show at The Neptune Theater, followed by a run of West Coast, Southwest, and Southern appearances. See below for a full list of upcoming tour dates, and find the record on all formats in the shop.